Amalfi lies between the Valle dei Mulini and the sea. It is the great stage on which one of the world’s most famous histories unfolded, the Marine Republic of Amalfi, which illuminated the Mediterranean with grandiose enterprises. That small space enclosed by the harsh Monti Lattari also earned another claim to fame for the production of handmade paper. There are no official documents to enable us to determine how far back the first production systems appeared, but it was presumably around the first half of the twelfth century. The people of Amalfi had learned the paper production techniques from the Arabs, indeed they called it “carta Bambagina” from the name of the Arab town El Mambig, though another school of thought believes that the name is associated with “bambagia” ( cotton wool ). Right from the start, the notaries of the Curia began to use it instead of Parchment for public deeds. Paper was then commonly used for writing private agreements, for legal deeds and stamped documents in all the towns in Southern Italy, at the courts of the Houses of Anjou and Aragon, of the Spanish Viceroy and the Bourbon court.Many foreigners, attracted by the quality of the product, came to Naples to have their works printed on Amalfi paper. It is not possible to establish just how many paper mills there where in the Valle dei Mulini. Thanks to Comm. 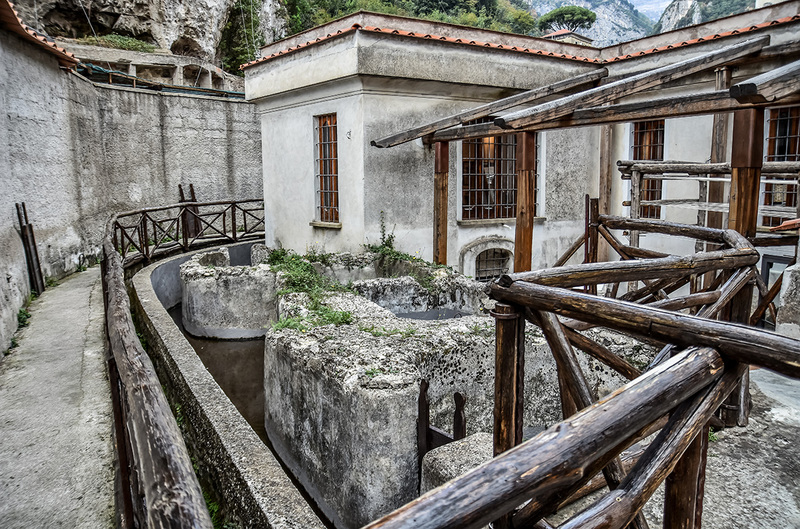 Nicola Milano, illustrious descendant of an old family of paper makers, Amalfi now has its own “Paper Mill Museum”. This Museum is housed in an old paper mill dates back to the fourteenth, or perhaps the middle of the thirteenth century. The premises were donated to the Foundation in 1969 and recognized by Decree no. 1294 of the President of the Republic on 22nd November 1971. Comm. Milano was aware not only of the imminent danger of a further decline of the structure, and even the final loss of its identity, but also of the importance of preserving the “history” of Amalfi’s hand-made paper for posterity. Today in the paper mill turned museum we can see the tools used over the centuries for making paper by hand. 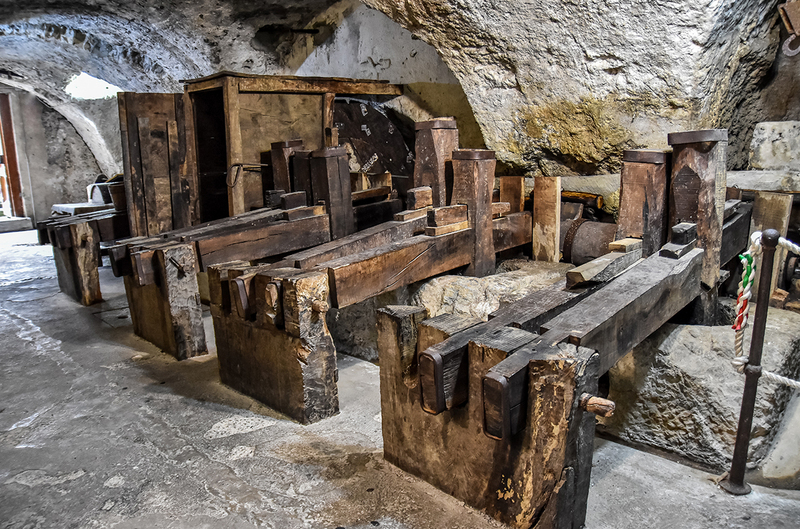 There are the old wooden mallets, operated by a hydraulic wheel, which used to beat and mash rags of linen, cotton and hemp, previously gathered in the mighty “stone beaters”. The mixture obtained was lifted from the beater with special wooden scoops and placed in the vat where it was diluted with water. The vat was composed of a tank, lined on the inside with majolica, high enough to allow the operator the most comfortable standing position. The operator would immerse in the vat a frame, the bottom of which was made of a wire screen with fine mesh, and collect a certain amount of pulp, distributing it evenly over the screen. After the water had drained off, a thin layer of pulp was left. The “sheet” was then placed on a “couch” of woollen left and covered with another felt. Many “sheets”, piled up with the same procedure, were then placed under a press to eliminate the water residue. There is one such press in the museum, still in working order, dating back to the eighteenth century. After the sheets had been pressed, the operator removed them and placed them one on top of the other, creating the so-called “post”. The “posts” were then transferred to the drying rooms to be dried in the air. The sheets were then treated with a solution of animal gelatin and smoothed by hand, after accurate quality selection. But the various levels of the paper mill also present some more “modern” aspects.In the seventeenth century, the “mallet beaters” were replaced with the “Hollanders”, new machines that could produce more quickly and at less cost.The one in the paper mill, which is hydraulically operated, was installed on 18th November 1745, as may be seen from the date scratched in the plaster on the wall.Instead of the frame, this “hand and machine” process used a cylinder covered with metallic fabric, half immersed in the pulp, from which it lifted a layer that stuck to the surface.The layer came off automatically and passed through two felt-coated rollers which removed the water. This was known as a “drum” machine. The paper, produced in sheets, was then placed to dry in the drying rooms. 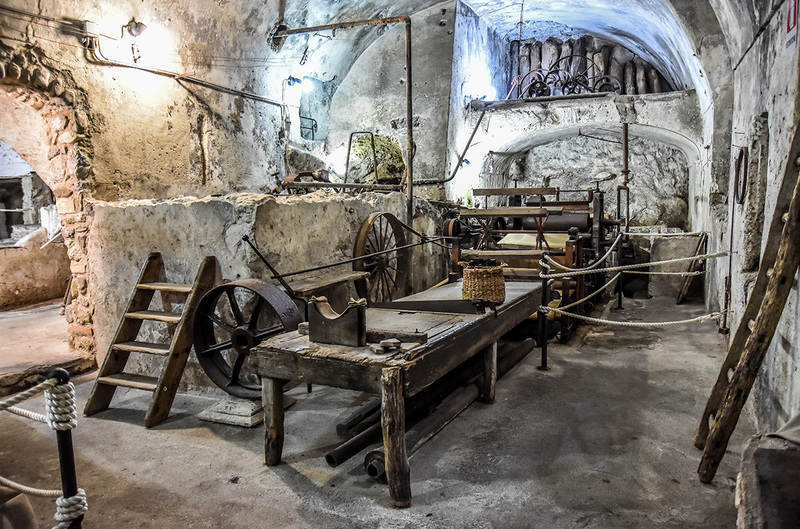 In the Paper Museum there is also an exhibition room, in an added modern structure, with a photographic display looking back to the origins of the paper mill. Here a number of old tools for producing and preparing hand-made paper are on show. Visitors can enjoy this experience, in memory of the many paper mills that once were in operation along the river Canneto and which now lie in ruins.ed by a pupil of Antonio Canova, Adamo Tadolini. It is possible to notice some bronze stutues, like The David, made by the neapolitan Gioacchino Varlese, inspired by other masterpieces.